Visiting The Waterside Arts Centre for a Christmas show is becoming something of a family tradition for us. 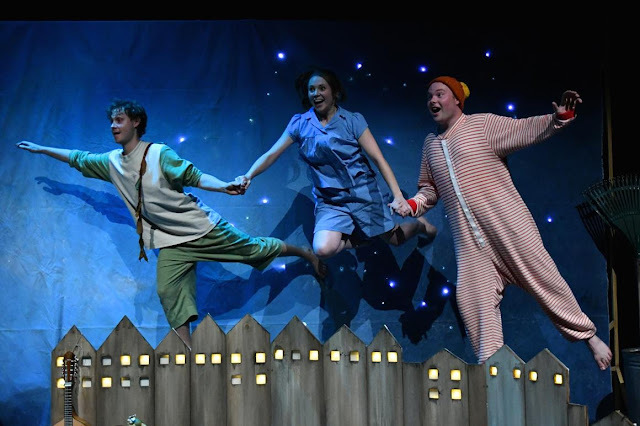 We were back this year to watch tutti frutti and York Theatre Royal’s Underneath A Magical Moon - a contemporary reimagining of the classic tale of Peter Pan. 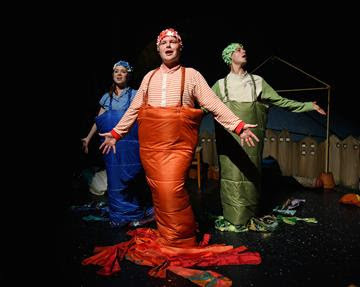 The story revolves round three children having a sleep out in their back yard. It's a summer evening; they are restless and can't go to sleep. The full moon in the sky that night has a magical feel to it. 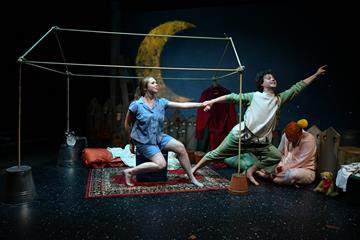 Underneath the magical moon, the children narrate the tale of Peter Pan. They start taking on parts in the story and it isn't long before the boundaries between imagination and reality are blurred. Is the magical moon playing tricks? Or have the children really transcended into the realms of fairyland? No matter what the truth, Underneath A Magical Moon brings to light the importance of imaginary play in childhood. The three children in the story have no recourse to expensive gadgets or toys. They use everyday garden and camping equipment to bring Peter Pan to life. A sleeping bag doubles up as a mermaid's tail and a wheelbarrow transforms into a pirate ship. Grace Lancaster, Jack Brett and Chris Draper share brilliant camaraderie on stage. They are in synch with each other throughout the performance and glide from one character into the next with effortless ease. One minute they are children in a city house, the next they are mermaids singing a melody and the next they are Wendy, Pan and Captain Hook engaged in battle. 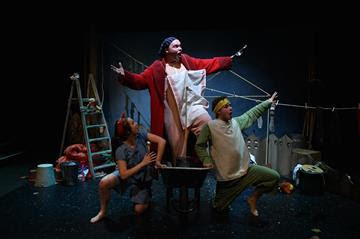 The production uses props to great effect. I particularly loved the sequence with Tinkerbell and the one where Wendy learns to fly. All you need to do is close your eyes and imagine. A beautiful message in today’s material world where most children, mine included, can’t seem to ever have enough toys. I left the theatre reinforcing this message to my son. Between this show and the Reverse Advent, I hope I have succeeded in conveying the true ethos of Christmas to him. Underneath A Magical Moon is playing at The Waterside till New Year’s Eve. Do head over to watch. Disclosure: We were given tickets to watch this show in exchange for a review. All opinions are my own. Photos courtesy The Waterside Arts Centre. This looks and sounds brilliant! Again, makes me want to go to the theatre! I can highly recommend watching it, Sophie. It is a beautiful production. Wow what a magical looking production I've never heard of this show - off to investigate further! It did have a fairyland feel to it. They had even dressed up the foyer in twinkling lights to add to the charm. I haven't heard of the show before but I like anything theatre inspired and bonus points if it has a magical/surreal feel to it! Looks like a lot of fun! I've not been to a theatre for a while which makes me want to go now. Looks like an amazing show. Great for this time of the year as well.